Note that we use the recipient QLineEdit 's text method to retrieve the text the user entered there, and the salutation QComboBox 's currentIndex method to get the index of the salutation the user selected. Run it, and you will get the same window as before, except now it actually generates our greeting when the Build button is pressed. Note that the same methods could be added to our absolute-positioning example from last time with the same effect. Now that we have an idea how to connect built-in signals to slots that we create, we are ready for our next installment, in which we will learn how to create our own signals and connect them to slots. Using Built-In Signals and Slots. Tuesday 29 th January Sunday 8 th June Connect its clicked signal to our slot. Imports must precede all others Create a Qt app and a window. Create a button in the window. Connect the signals to the slots. Show the window and run the app. Every Qt application must have one and only one QApplication object;. Initialize the object as a QWidget and. Create the QVBoxLayout that lays out the whole form. Create the form layout that manages the labeled controls. A QApplication instance will propagate the event to all toplevel widgets, where a reimplementation of changeEvent can re-translate the user interface by passing user-visible strings via the tr function to the respective property setters. User-interface classes generated by Qt Designer provide a retranslateUi function that can be called. See also removeTranslator , translate , QTranslator:: The return value of this function may change when a QCoreApplication is created. It is not recommended to call it before creating a QCoreApplication. The directory of the application executable not the working directory is part of the list if it is known. In order to make it known a QCoreApplication has to be constructed as it will use argv to find it. Qt provides default library paths, but they can also be set using a qt. Paths specified in this file will override default values. Note that if the qt. If it is not found when calling this function, the default library paths will be used. The plugin installation directory and its existence may change when the directory of the application executable becomes known. If you want to iterate over the list, you can use the foreach pseudo-keyword:. Sends event to receiver: Returns the value that is returned from the receiver's event handler. Note that this function is called for all events sent to any object in any thread. For certain types of events e. There are five different ways that events can be processed; reimplementing this virtual function is just one of them. All five approaches are listed below:. This function will not be called for objects that live outside the main thread in Qt 6. Applications that need that functionality should find other solutions for their event inspection needs in the meantime. The change may be extended to the main thread, causing this function to be deprecated. If you override this function, you must ensure all threads that process events stop doing so before your application object begins destruction. This includes threads started by other libraries that you may be using, but does not apply to Qt's own threads. Adds the event event , with the object receiver as the receiver of the event, to an event queue and returns immediately. The event must be allocated on the heap since the post event queue will take ownership of the event and delete it once it has been posted. It is not safe to access the event after it has been posted. When control returns to the main event loop, all events that are stored in the queue will be sent using the notify function. Events are sorted in descending priority order, i. The priority can be any integer value, i. EventPriority for more details. Events with equal priority will be processed in the order posted. See also sendEvent , notify , sendPostedEvents , and Qt:: Processes all pending events for the calling thread according to the specified flags until there are no more events to process. You can call this function occasionally when your program is busy performing a long operation e. In the event that you are running a local loop which calls this function continuously, without an event loop, the DeferredDelete events will not be processed. This can affect the behaviour of widgets, e. QToolTip , that rely on DeferredDelete events to function properly. An alternative would be to call sendPostedEvents from within that local loop. Processes pending events for the calling thread for maxtime milliseconds or until there are no more events to process, whichever is shorter. You can call this function occasionally when your program is busy doing a long operation e. Tells the application to exit with return code 0 success. Equivalent to calling QCoreApplication:: It's common to connect the QGuiApplication:: Removes path from the library path list. If path is empty or not in the path list, the list is not changed. Removes an event filterObject from this object. The request is ignored if such an event filter has not been installed. It is always safe to remove an event filter, even during event filter activation i. Removes all events of the given eventType that were posted using postEvent for receiver. The events are not dispatched, instead they are removed from the queue. You should never need to call this function. If you do call it, be aware that killing events may cause receiver to break one or more invariants. If receiver is null, the events of eventType are removed for all objects. If eventType is 0, all the events are removed for receiver. You should never call this function with eventType of 0. If you do call it in this way, be aware that killing events may cause receiver to break one or more invariants. Removes the translation file translationFile from the list of translation files used by this application. It does not delete the translation file from the file system. See also installTranslator , translate , and QObject:: Sends event event directly to receiver receiver , using the notify function. Returns the value that was returned from the event handler. The event is not deleted when the event has been sent. The normal approach is to create the event on the stack, for example:. See also postEvent and notify. Immediately dispatches all events which have been previously queued with QCoreApplication:: Events from the window system are not dispatched by this function, but by processEvents. 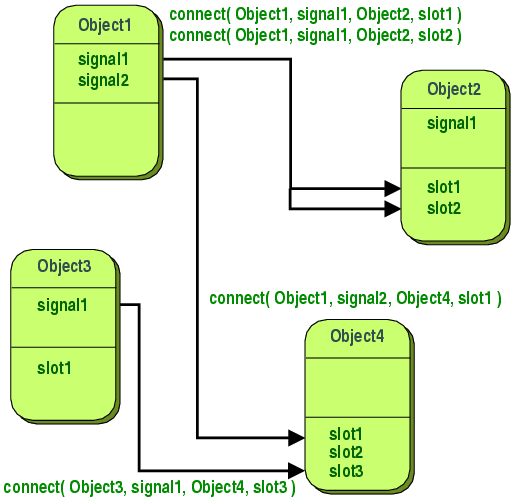 This method must be called from the thread in which its QObject parameter, receiver , lives. See also flush and postEvent. The Qt 5 pointer-to-member syntax allows you to catch errors at compile-time rather than runtime. A fixit is included for automatically rewriting your connects to the new form. Using normalized signatures prevents unneeded memory allocations. Warns when overriding signals in derived classes. APIs with overridden signals are hard to use, unexpected and bug-prone. To make it worse, Qt even allows you to override a signal with a non-signal , and vice-versa. This check warns when a signal is virtual. Virtual signals make it very hard to read connect statements since they are unexpected. Signals cannot be declared virtual. This aims to prevent unintentionally marking a getter as slot, or connecting to the wrong method. Conversely, you should not use those macros when calling something other than a signal. Warns when auto-connection slots are used. These types of connections are very brittle, as a simple object rename would break your code. In Qt 5 the pointer-to-member-function connect syntax is prefered as it catches errors at compile-time. Qt, or more specifically, moc, is very permissive in what it allows, either due to technical limitations, or simply the requirement to maintain source compatibility. Sometimes we have classes are not in a class hierarchy, but have the same slot. Then you can only use the old-style connect, but we get warnings everywhere. So what is a correct solution here? How can Qt make simpler the authoring of common properties shared amongst a set of object? Do you intend to support Verdigris? Number 10 is wrong for signals.